You can never have too much practice managing money! Luckily, your 1st grader can deal with small amounts, like adding coins to buy candy. Cut out the coins from his page and use them to reach the exact price. Money math can be a fun way to practice addition. 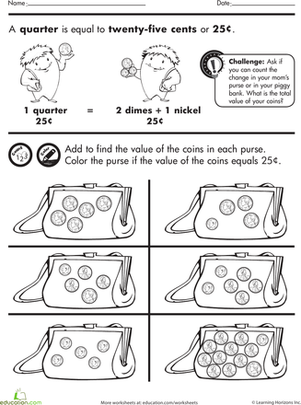 Your beginning coin counter can practice matching groups of coins with equal values! Looking for a math work sheet that practices coin counting? This printable is great for young counters. These coin purses are full of all sorts of coins. Can your child figure out the value of each one?